Qube Cinema partnered with Moving Image Technologies (MiT) to provide multiscreen projection of synchronized digital cinema content in Hall H at Comic-Con International in San Diego. Visitors to this marquee event saw digital presentations on four screens, simultaneously projected from five synchronized DLP projectors, all powered by the Qube XP-I server and Xi Integrated Media Blocks (IMBs). Organizers of large events now have a way of synchronizing multiple DCI compliant Series 2 projectors, while maintaining the stringent DCI security requirements that content owners demand. The ability of the Qube XP-I server and Xi IMBs to synchronize multiple projectors had previously been demonstrated at the world premieres of The Hobbit, where they performed to deliver the latest high frame rate 3D version of the movie. The XP-I server has the throughput to play back digital content to multiple DLP projectors at 1 Gbps, sufficient to show 2K 3D content at up to 120 fps per eye. 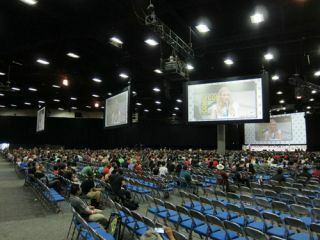 Over two dozen different presentations were staged in Hall H at Comic-Con, including a 3D show for a standing-room-only crowd of over 6,500 guests. One large screen, and three “delay” screens suspended from the ceiling for audience members more than 150 feet from the stage, showed 2D and RealD 3D content from NEC NC2000 and NC3200 Series 2 DLP projectors synchronized by the Qube XP-I server and Xi IMBs. The five projectors and images on all four screens were kept in sync with Qube’s native ability to sync multiple IMBs. The XP-I server was connected to the projectors via Gigabit Ethernet, instead of the traditional HD-SDI cables that had been used at previous Comic-Cons. All the systems were controlled from a single laptop. The Qube Cinema system is designed for large-scale gatherings such as Comic-Con, as well as concerts and corporate and fundraising events, where multiple screens are displaying digital cinema content simultaneously.